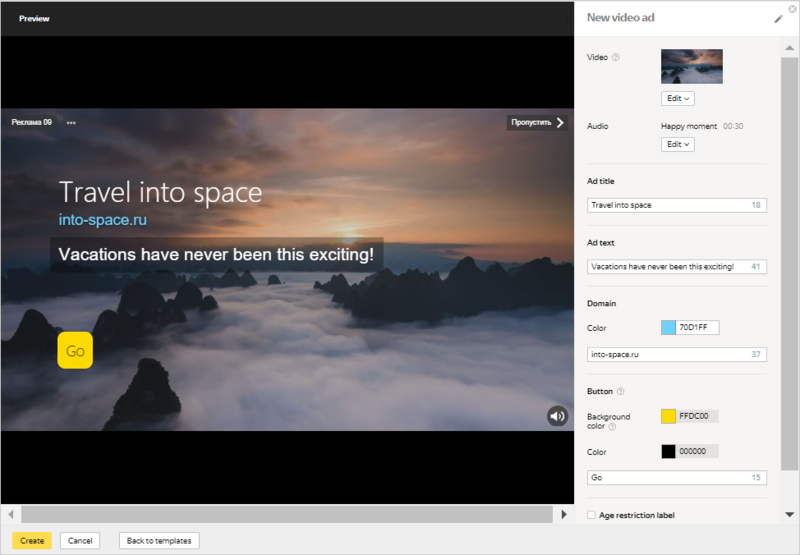 The Ad Builder has templates that you can use to create interesting video ads. You can create an unlimited number of creatives for free, without any special skills or experience. In the Creative section, click Add → Create new from template. Choose one of the template options in the Creative Ad Builder window that opens. To make a creative, you can use your own video, choose one from the library, or use a previously uploaded video (including videos you have used for video extensions). Our experiments have shown that using your own video is 5 times more effective than using a stock video from the library. You don't need to hire professionals or rent a studio to make your own video. You can film a clip on your smartphone if it has a good camera, buy a video from a stock database, or make an animation using photos of your products. Pay attention to the requirements for video clip content. You can upload a videoclip of up to 60 seconds, but only the first 15 seconds will be shown. Upload your own video from your computer or link to it. The audio will be added automatically from the video you upload. It will take a few minutes to process your video clip. If any errors occur while loading it, you will see an error message. More details about potential errors. Select the background video and audio from the library. You will get more conversions if they match the subject of your ad. It's possible that several advertisers may choose the same video background. If they have the same impression criteria, subject, and target audience, impressions for video ads that use the same video clips will be distributed among users. For example, a user saw a video ad from the first advertiser. Now the user will see this video clip only in association with this advertiser for 30 days. When the user sees another advertiser's video ad, it will have a different video in the background. The system will change the video's "owner" if the first advertiser pauses their ad or changes the background video. To increase your reach, you can create multiple video ads with different videos, or use your own video. Enter the ad title and text, and specify the link to your site in Domain. The domain shown in the creative must match the domain of the landing page. Set the color for the text and button. Enter the age restrictions and required information under Legal information. The ad creative must include all information required by law and the Yandex Ad Serving Rules, including warnings . The texts in the creative and the domain must meet the same requirements as for all other ads served through Yandex.Direct. You can view all changes you make instantly in the preview area. When you have finished working on your ad creative, click Create. The creative will be added to the video ad.